Pelling is made of majestic mountains and swirling clouds. 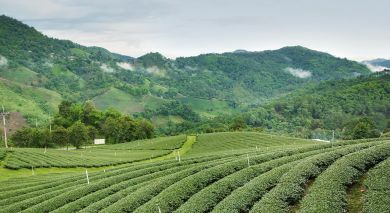 It is a fast-growing yet idyllic town with breathtaking views of the snowcapped Kanchenjunga, thick Alpine forests and an abundance of history and nature. Pelling has an ‘amphitheater-like’ setting that makes for a perfect gateway of relaxation, nature trails and treks. The Elgin Mount Pandim in Pemayangtse set on 8acres of virgin forest and landscaped gardens, was the Sikkim royal family's summer retreat, now a Heritage Luxury Boutique resort. Set out on a full day excursion to Yuksom – the capital of the erstwhile Kingdom of Sikkim, where the first chogyal (monarch) was consecrated in 1641 by three Lamas. Tour the Khecheopalri Lake, considered sacred by the Buddhists as well as the Hindus. It is believed that the birds of these forests do not permit even a single leaf to float on the lake! While in Yuksom, visit the Tashding bazaar and monastery, constructed on top of a heart-shaped hill with the sacred Mt. Khang-Chen Dzonga in the backdrop. Visit Khecheopalri Lake or Kha-Chot-Palri, a sacred Lake for Buddhists and Hindus, believed to be a wish fulfilling lake. Located about 28kms from Pelling at a height of about 6,000ft/1,828m, Khecheopalri Lake remains hidden in the rich forest cover, surrounded by mountains and wildlife. Pelling, a pleasant little town in west Sikkim, lies at an altitude of 2,150m/7,053ft, about 130km from Siliguri and 115km from Gangtok. It is famous for its stunning views of the snowcapped Kanchenjunga range, the third highest peak in the world. Visit the waterfalls, and Khecheopalri or Bissau Lake, known as the ‘wish fulfilling’ lake. Get a chance to visit and see the magnificent Sangay waterfalls.